Sizers, as represented by the wx.Sizer class and its descendants in the wxPython class hierarchy, have become the method of choice to define the layout of controls in dialogs in wxPython because of their ability to create visually appealing dialogs independent of the platform, taking into account the differences in size and style of the individual controls. Editors such as wxDesigner, DialogBlocks, XRCed and wxWorkshop create dialogs based exclusively on sizers, practically forcing the user to create platform independent layouts without compromises. The next section describes and shows what can be done with sizers. The following sections briefly describe how to program with individual sizer classes. The layout algorithm used by sizers in wxPython is closely related to layout systems in other GUI toolkits, such as Java’s AWT, the GTK toolkit or the Qt toolkit. It is based upon the idea of individual subwindows reporting their minimal required size and their ability to get stretched if the size of the parent window has changed. This will most often mean that the programmer does not set the start-up size of a dialog, the dialog will rather be assigned a sizer and this sizer will be queried about the recommended size. This sizer in turn will query its children (which can be normal windows, empty space or other sizers) so that a hierarchy of sizers can be constructed. Note that wx.Sizer does not derive from wx.Window and thus does not interfere with tab ordering and requires very few resources compared to a real window on screen. What makes sizers so well fitted for use in wxPython is the fact that every control reports its own minimal size and the algorithm can handle differences in font sizes or different window (dialog item) sizes on different platforms without problems. For example, if the standard font as well as the overall design of Linux/GTK widgets requires more space than on Windows, the initial dialog size will automatically be bigger on Linux/GTK than on Windows. There are currently five different kinds of sizers available in wxPython. 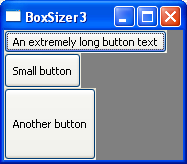 Each represents either a certain way to lay out dialog items in a dialog or it fulfills a special task such as wrapping a static box around a dialog item (or another sizer). These sizers will be discussed one by one in the text below. For more detailed information on how to use sizers programmatically, please refer to the section Programming with BoxSizer. Within wxDesigner, this stretch factor gets set from the Option menu. Appends a child to the sizer. window – a window, a spacer or another sizer to be added to the sizer. Its initial size (either set explicitly by the user or calculated internally) is interpreted as the minimal and in many cases also the initial size. 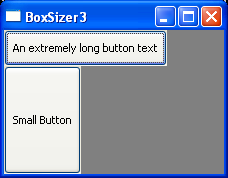 proportion (int) – this parameter is used in wx.BoxSizer to indicate if a child of a sizer can change its size in the main orientation of the wx.BoxSizer - where 0 stands for not changeable and a value of more than zero is interpreted relative to the value of other children of the same wx.BoxSizer. For example, you might have a horizontal wx.BoxSizer with three children, two of which are supposed to change their size with the sizer. Then the two stretchable windows would get a value of 1 each to make them grow and shrink equally with the sizer’s horizontal dimension. flag (int) – OR-combination of flags affecting sizer’s behaviour. border (int) – determines the border width, if the flag parameter is set to include any border flag. userData (object) – allows an extra object to be attached to the sizer item, for use in derived classes when sizing information is more complex than the proportion and flag will allow for. Let’s create a vertical sizer (children will be placed on top of each other) and place two buttons in it. All the “extra” parameters are set to 0; we’ll worry about them later. The buttons are just big enough to accommodate the text in them. In fact, any control placed into a sizer this way will appear at its minimum size unless we change the parameters. The window size is not changed to fit the sizer. This results in a lot of ugly empty space. This is particularly useful in circumstances like this one, in which the wx.Frame‘s default size would otherwise be much too big or small to show most layouts in an aesthetically pleasing manner. Same code as above, with window resized. Notice that the bottom button is still three times as tall as the top button. Same code as above, with window resized. The top button (proportion 0) is still the minimum height, and the third button is still twice the height of the second. This is especially useful when you want, for example, a button at the bottom which is only as big as necessary, and some other control that occupies the rest of the frame. To do so, give the button proportion 0 and the other control a number greater than 0. Mac users in particular will appreciate you for not creating huge aqua-styled buttons. The flag argument accepted by wx.Sizer.Add is a OR-combination of the following flags. Two main behaviours are defined using these flags. One is the border around a window: the border parameter determines the border width whereas the flags given here determine which side(s) of the item that the border will be added. The other flags determine how the sizer item behaves when the space allotted to the sizer changes, and is somewhat dependent on the specific kind of sizer used. These flags are used to specify which side(s) of the sizer item the border width will apply to. wx.EXPAND The item will be expanded to fill the space assigned to the item. wx.FIXED_MINSIZE Normally wx.Sizers will use wx.Window.GetEffectiveMinSize to determine what the minimal size of window items should be, and will use that size to calculate the layout. This allows layouts to adjust when an item changes and its best size becomes different. If you would rather have a window item stay the size it started with then use wx.FIXED_MINSIZE. wx.RESERVE_SPACE_EVEN_IF_HIDDEN Normally wx.Sizers don’t allocate space for hidden windows or other items. This flag overrides this behavior so that sufficient space is allocated for the window even if it isn’t visible. This makes it possible to dynamically show and hide controls without resizing parent dialog, for example. The wx.ALIGN* flags allow you to specify the alignment of the item within the space allotted to it by the sizer, adjusted for the border if any. Let’s start with the simplest case: the alignment flags. These are pretty self-explanatory. Next is the wx.EXPAND flag. This is synonymous with wx.GROW. You can see that the first button takes its minimum size, and the second one grows to match it. This affects controls in the opposite manner of the second parameter; wx.EXPAND in a vertical sizer causes horizontal expansion, and in a horizontal sizer it causes vertical expansion. Next is wx.SHAPED. This flag ensures that the width and height of the object stay proportional to each other. It doesn’t make much sense for buttons, but can be excellent for bitmaps, which would be contorted or clipped if not scaled proportionally. Same code as above, with window resized. The width grew dramatically with the height. In fact, it didn’t quite grow vertically the whole way because it couldn’t maintain the correct ratio while doing so. Finally, we have the border flags. These only make sense when the border parameter is greater than 0, and describe the sides of the control on which the border should appear. In order to demonstrate this most clearly, we’ll keep the wx.EXPAND flag. You can see that the button is offset from the specified edges of the sizer by the number of pixels that we specified in the border parameter. You can hide controls contained in sizers the same way you would hide any control, using the wx.Window.Show method. However, wx.Sizer also offers a separate method which can tell the sizer not to consider that control in its size calculations. To hide a window using the sizer, call wx.Sizer.Show. You must then call Layout on the sizer to force an update. This is useful when hiding parts of the interface, since you can avoid removing the controls from the sizer and having to add them back later. This is supported only by wx.BoxSizer and wx.FlexGridSizer. For programming information, see wx.GridSizer. The basic idea behind a wx.BoxSizer is that windows will most often be laid out in rather simple basic geometry, typically in a row or a column or several hierarchies of either. 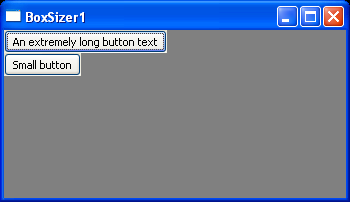 As an example, we will construct a dialog that will contain a text field at the top and two buttons at the bottom. 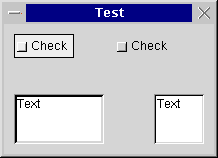 This can be seen as a top-hierarchy column with the text at the top and buttons at the bottom and a low-hierarchy row with an OK button to the left and a Cancel button to the right. In many cases (particularly dialogs under Unix and normal frames) the main window will be resizable by the user and this change of size will have to get propagated to its children. In our case, we want the text area to grow with the dialog, whereas the button shall have a fixed size. In addition, there will be a thin border around all controls to make the dialog look nice and - to make matter worse - the buttons shall be centred as the width of the dialog changes. It is the unique feature of a box sizer, that it can grow in both directions (height and width) but can distribute its growth in the main direction (horizontal for a row) unevenly among its children. In our example case, the vertical sizer is supposed to propagate all its height changes to only the text area, not to the button area. This is determined by the proportion parameter when adding a window (or another sizer) to a sizer. It is interpreted as a weight factor, i.e. it can be zero, indicating that the window may not be resized at all, or above zero. If several windows have a value above zero, the value is interpreted relative to the sum of all weight factors of the sizer, so when adding two windows with a value of 1, they will both get resized equally much and each half as much as the sizer owning them. Then what do we do when a column sizer changes its width? This behaviour is controlled by flags (the second parameter of the Add() function): Zero or no flag indicates that the window will preserve it is original size, wx.GROW flag (same as wx.EXPAND) forces the window to grow with the sizer, and wx.SHAPED flag tells the window to change it is size proportionally, preserving original aspect ratio. When wx.GROW flag is not used, the item can be aligned within available space. wx.ALIGN_LEFT, wx.ALIGN_TOP, wx.ALIGN_RIGHT, wx.ALIGN_BOTTOM, wx.ALIGN_CENTER_HORIZONTAL and wx.ALIGN_CENTER_VERTICAL do what they say. wx.ALIGN_CENTRE (same as wx.ALIGN_CENTER) is defined as (wx.ALIGN_CENTER_HORIZONTAL | wx.ALIGN_CENTER_VERTICAL). Default alignment is wx.ALIGN_LEFT | wx.ALIGN_TOP. As mentioned above, any window belonging to a sizer may have a border, and it can be specified which of the four sides may have this border, using the wx.TOP, wx.LEFT, wx.RIGHT and wx.BOTTOM constants or wx.ALL for all directions (and you may also use wx.NORTH, wx.WEST etc. instead). These flags can be used in combination with the alignment flags above as the second parameter of the Add() method using the binary or operator |. The sizer of the border also must be made known, and it is the third parameter in the Add() method. This means, that the entire behaviour of a sizer and its children can be controlled by the three parameters of the Add() method. # has a text ctrl at the top and two buttons at the bottom. Note that the new way of specifying flags to wx.Sizer is via wx.SizerFlags. This class greatly eases the burden of passing flags to a wx.Sizer. wx.GridSizer is a sizer which lays out its children in a two-dimensional table with all table fields having the same size, i.e. the width of each field is the width of the widest child, the height of each field is the height of the tallest child. wx.FlexGridSizer is a sizer which lays out its children in a two-dimensional table with all table fields in one row having the same height and all fields in one column having the same width, but all rows or all columns are not necessarily the same height or width as in the wx.GridSizer. wx.StaticBoxSizer is a sizer derived from wx.BoxSizer but adds a static box around the sizer. Note that this static box has to be created separately. wx.GridBagSizer is a rather special kind of sizer which, unlike the other classes, allows to directly put the elements at the given position in the sizer. Please see its documentation for more details.